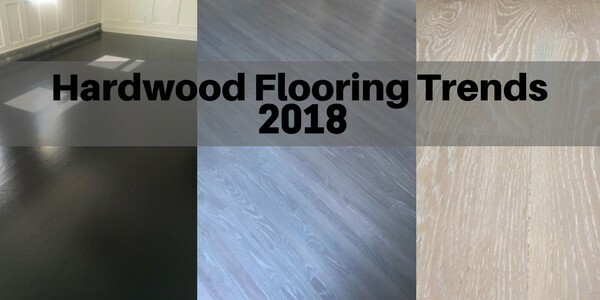 Hardwood flooring tops the list for our favorite flooring trends for 2018. 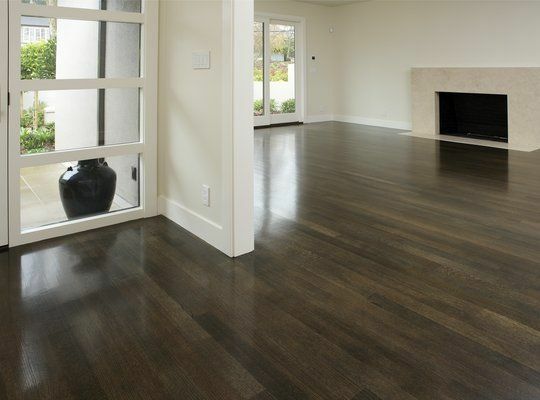 Hardwood continues to grow in popularity and is by far the preferred flooring type for homes. Ironically, this is followed by all sorts of products trying to mimic the look of hardwood. But still, most people want the real thing…REAL HARDWOOD. It’s stylish, comfortable, warm, timeless, natural and lasts for over a century. Hardwood makes a house a home, and you can refinish hardwood over the years to refresh. You’ll also love that it will improve the value of your home at the same time. For 2018 the trend toward cooler tones continues. There’s been a move away from warmer tones (reds, red/brown blends or yellow undertones) and a preference towards browns that are more pure and cooler (no red undertones). Cool tones are preferred for both walls (especially grays) and floors. Our customers prefer pre-finished stains/finishes for the best in durability and to avoid the mess of on-site stain/refinishing. There is an impressive selection of prefinished stains to choose from and more depth than ever to the stain colors. Dark stains are more opaque and cover grain for a modern look. Homes with a mix of wood flooring can achieve more overall uniformity with the new dark stains that are trending. Homeowners who truly want a sustainable wood flooring product should purchase American hardwood. We can buy hardwoods from forests that are a few hundred miles away, and North America does a good job replenishing our forests as we cut them down. Oak, hickory, maple, heart pine: These classic American hardwoods all are making a comeback. What we’re seeing more and more of in flooring are classic looks using new technology A perfect example is reclaimed hardwood. 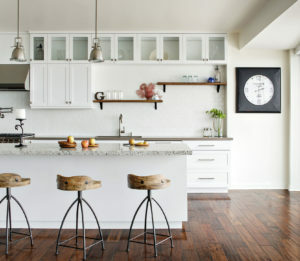 New prefinished hardwood flooring is designed to offer you the charm of reclaimed timber — right down to that timeless hand-hewn look — but without the high costs associated with true salvaged lumber. And pre-finished engineered wood will stand up to moisture fluctuations better than any reclaimed hardwood. Contact us at your convenience for a free measure and quote.